We really like this item. Our new home doesn't have the counter space for more than one person to be prepping food at the same time and this solved that problem nicely. The extra storage space is great to store small appliances that would otherwise be cluttering the countertop. Add elegance and extra storage to your home with this rolling kitchen cabinet organizer with a drop leaf from HomCom. 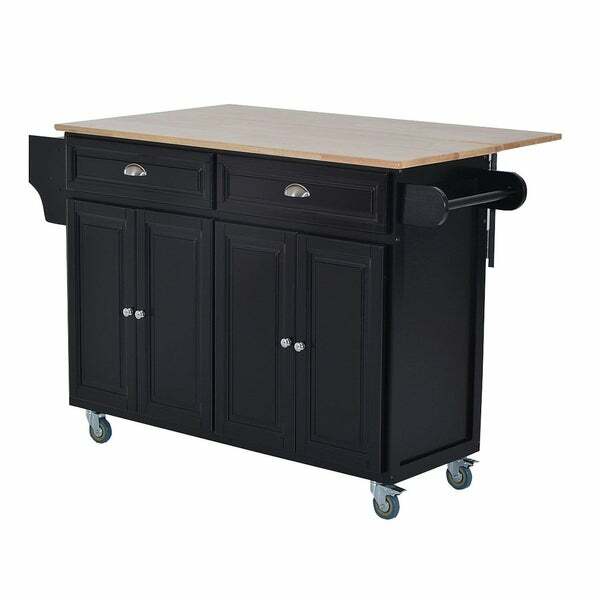 Designed with functionality, this large kitchen island cart will make your life easier while adding taste and style to your kitchen. The durable wood materials feature handsome pine wood with a rubberwood top for a sophisticated look. The drawers and cabinets can be used as a pantry or to store dishes, pots, pans, etc. A handy towel rack, and wooden handle on either side offers even more convenience and an effortless way to transport. 4 omnidirectional wheels with 2 brakes provide easy movement and steady placement for when you’re working in the kitchen. The drop leaf counter top is idea for small kitchens that need more workspace or extending your cooking space and conveniently drops down when not in use. Whether you want an additional work surface, to get organized, or simply need a way to maximize your existing space, HomCom has got you covered with a stylish solution to your storage dilemma. - Net Weight: 100 lbs. Dimensions 57.5 In. X 29.5 In. X 36.0 In. I love my new Island. I needed a extra storage in my kitchen and the island is perfect. It has two drawers and 2 nice size cabinets where I am keeping my crockpots and cookers. It took two of us to do the first step of assembly because one had to hold the parts while the other put slid another part onto them. However, it was fairly easy to put together and took maybe 2 hours. Half part deliVered after 2 wks. The smell of the paint is very strong. Gives me a headache. I don’t recommend this island table . For the price, I think this is a very good buy. Yes, it takes an hour or two to put together, but if you follow the diagrams carefully, it's not that difficult--I put it together myself with no help at all. I did use a cordless drill/screwdriver instead of a manual screwdriver. 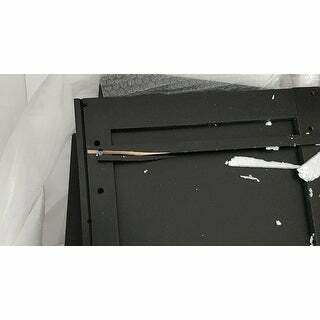 All of the parts were included in my packages and none of the pieces were damaged. There is a mild chemical smell but that's normal with most new pieces of furniture, rugs, etc. I expect it to dissipate over time. This is a good "happy medium" between the really small, cheap kitchen islands and the large, heavy, expensive ones. Took several hrs to put together but all the parts were there and nothing broken. It looks great in the kitchen. Would have given 5 stars but the smell of the wood (chemical) was horrible and I did have to run the air purifier. Would buy again just leave parts outside on the porch (covered of course). Came with damaged parts. 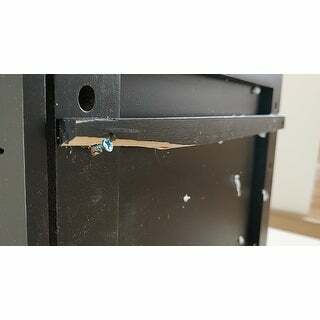 Looks like on of the sides was damaged because of the screw placement. Also minor scratches and dents. When contacted customer service I was told that I have to wait for about a week to get this issue resolved, not cool - I have to wait for a part, then fix what was done wrong. Not satisfied with this island, nor with customer service. Wouldn't recommend. And yeah, smell is pretty strong, had to leave it open to air it out before assembling. This was an awesome purchase, it matches just right with the granite and backsplash. It’s sturdy and elegant. Very nice piece. "For current owners, is the top able to be used like a cutting board?" A rubberwood top can be used as a cutting board. "How many boxes does it ship in?" This kitchen island was shipped in 2 boxes. "What are the internal measurements of the drawers?"